Review essays and statements written for special occasions may reveal as much about the writer as those written about; this is the presumption undergirding this collection of thirty-five years of criticism and commentary by Irving Louis Horowitz. For this volume, he selected his comments on famous, near famous, and infamous sociologists, political scientists, and assorted literary figures in between. Taken as a whole, this volume will surprise and delight readers who are acquainted with Horowitz's other works as well as those who are interested in the people he writes about.The book covers notable social scientists, from Arendt to Zetterberg, and such major figures in between as Becker, Bell, de Jouvenel, Mills, Parsons, Solzhenitsyn, and more than eighty others who have had an effect on the contemporary social and political landscape. Each is critically examined, sometimes positively, other times negatively. 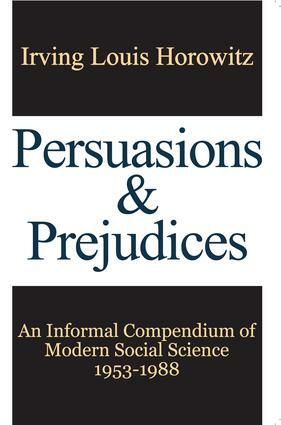 Horowitz was a major figure in his own right, and his writing here displays the kind of refreshing frankness experts will expect and the general reader will appreciate.The underlying assumption behind the volume, giving its disparate parts a unified characteristic, is that together these observations on others amount to a general perspective on social science held by the author. Whether his larger ambition is accepted or disputed, there is no doubt that the volume provides a standard against which to measure the literary quality of writing in the world of professional social research.